This tour will take you to the two palaces located on the southern coast of the Gulf of Finland. The Peterhof Grand Palace was built by the order of Peter the Great, to be the official summer residence of the Romanov’s family. The picturesque Lower park counts 114 various fountains ans 3 large cascades. Peterhof is usually compared by it’s beauty and luxury to the Versailes Palace in France. 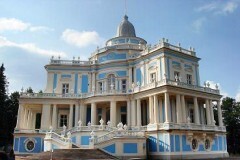 Oranienbaum Palace is located in the town of Lomonosov. This property was firstly owned by the Grand Duke Menshikov, and lately by the Empress Catherine II. The beautiful Chinese Palace of Oranienbaum is designed in a an original “eastern style” that represents the XVIIIth century visions of the culture of the east.